Artist Becky Elia has always been fascinated by colours. But it’s not just the colours in themselves that interest her, it’s the science of colours and how our perceptions of them change depending on how they are presented to us. Currently, Becky’s colour-of-choice is Ultramarine blue. 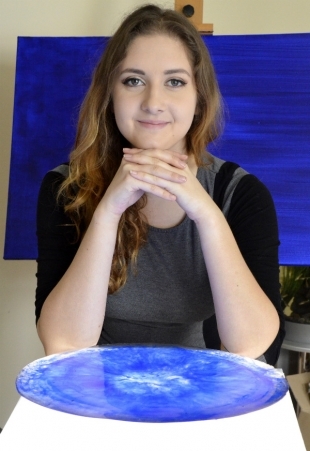 It was her blue-inspired installation that caught the eye of the judges of the 2018 Delamore Arts Prize, awarded each year to the most promising artist to graduate from the Plymouth College of Art Painting, Drawing and Printmaking Course. The award is judged on the work shown at the college’s end-of-course exhibition. For Becky’s exhibit, she created a blue room with blue resin lenses for the ceiling light source and three white plinths. Each plinth had a small pile of colour pigment sitting on the top – one yellow, one blue and one red. Becky will also be exhibiting some of her paintings, which continue the blue theme and will also include gold leaf – “but used differently to how gold leaf is traditionally used in art”. 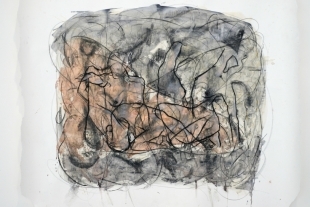 The Trustees of Delamore Arts are delighted to award a prize to the most promising artist to graduate from the Plymouth College of Art Painting Drawing and Printmaking course each year. The prize includes a cash sum to help the artist set up their business or to finance a specific art project and invites the artists to exhibit with Delamore Art the following May during our annual exhibition. The winner of the prize for 2017 and exhibiting with us at Delamore Art 2018 is Meryl Hopper. Meryl's practice revolves around people - personal and political - and identity - group and individual. Her work has moved through the encapsulation of world issues in the personal; portraiture - including self-portraiture - as a means of exploring identity; a study of the facets and structures of identity itself; and the effect of experience on outlook and presentation as we interact with the world around us, particularly seen in how the unconscious affects our artistic expression. 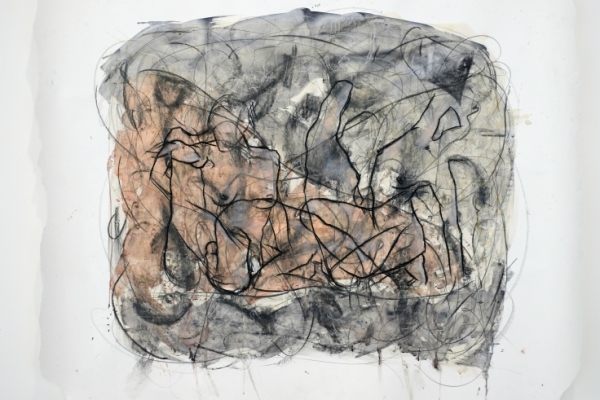 She has recently transitioned from a love of painting with oils and a more considered output, to a desire for the immediacy of expression that drawing alone allows, together with a more intuitive, holistic approach where the whole body and psyche are one in the production of the work. The previous Winner was Oona Wagstaff.